Isn't this a cool bird? 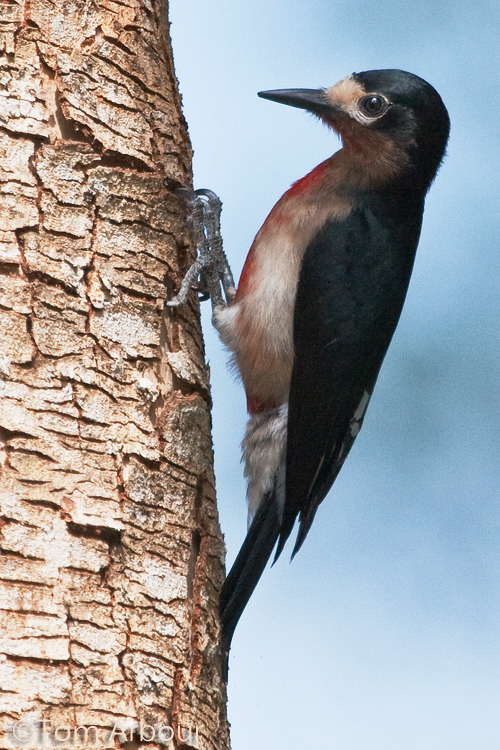 The Puerto Rican woodpecker was the last endemic bird that I saw on our week long trip to Puerto Rico. And I didn't have to travel far. Just on the edge of our little "villa" complex was a small low-lying forest. I had staked out the area at the beginning of the trip and didn't see much. But on the next to last day, the woods adjacent to the tennis court was full of action, including the drumming of a male and female Puerto Rican Woodpecker, the fourth and final endemic bird of Puerto Rico I was able to photograph. 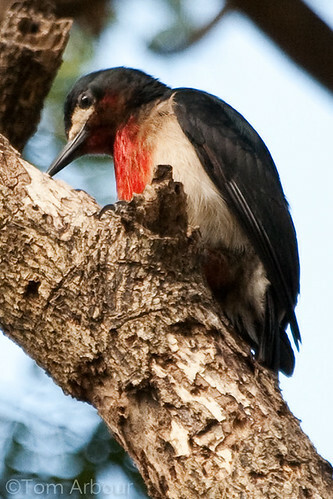 The female above has less red than the male, pictured below. If you missed the other endemic birds of Puerto Rico, be sure to check out Adelaide's Warbler, the Puerto Rican Tody, and the Puerto Rican Vireo. 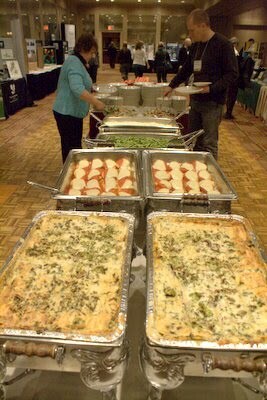 Hiram College friends, including your blogger. 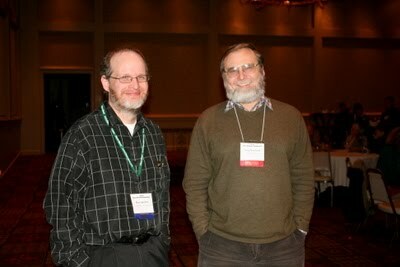 Sedgeheads, sedgeaholics, these guys love sedges. 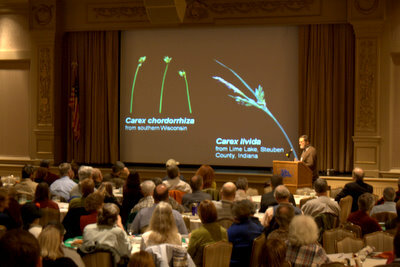 Another fantastic 2010 Ohio Botanical Symposium is in the books, thanks to all the great speakers, and to the over 400 attendees of this years event. I believe that a good time was had by all. 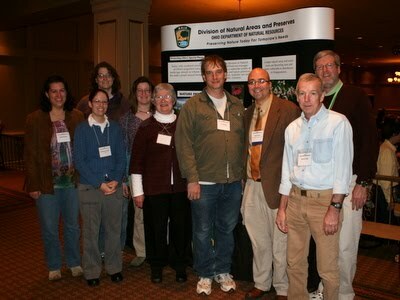 Although I've been showing images of birds and wildlife, at heart I'm an ecologist. My brain wants to understand how things work- and how things interact. Without a critical understanding of the physical conditions of a place, and the plants that are able to survive in these conditions, you can't fully understand the animals. 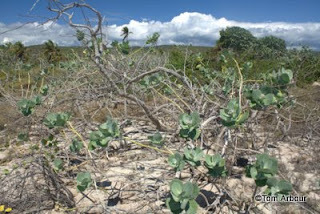 Guanica is a great example of how plants evolve to survive under harsh environmental conditions. 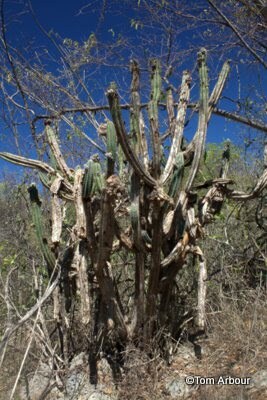 The Guanica State Forest is a United Nations world biosphere reserve, an international designation denoting that this is a globally significant ecosystem. 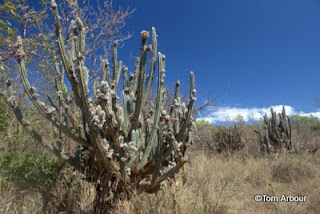 Over 700 species of native plants dwell in this amazingly well preserved tropical dry forest. I could spend five years learning the flora of this place, and I'd still be learning new things each day. 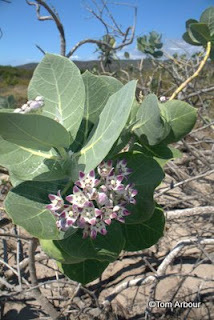 For now, I am only armed with photos, but the next time we go to Guanica, I'm hoping to learn the names of a few of the more charismatic plant species. A few steps from the Puerto Rican Tody and the Puerto Rican Vireo, Megan and I quickly saw this beautiful little warbler. 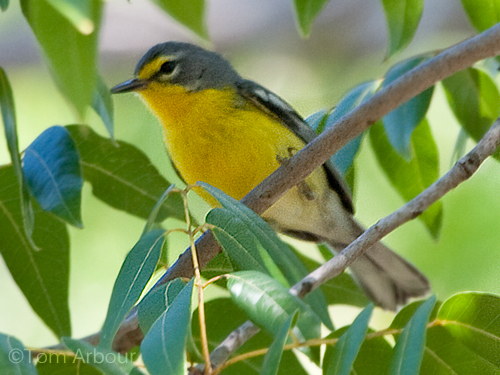 Since there are several warblers species that winter on the island, I had to look carefully, but this species turned out to be Adelaide's Warbler, yet another Puerto Rican endemic. From what I've read, this species lives on the island year round, and doesn't migrate north like the warbler species we see passing through North America. And this is a relatively new species to science. Up until about 2000, it was considered a subspecies, but now ornithologists consider it to be a full blown species. For more photos and information about this neat little bird you'll want to check out this post at 10000 birds. 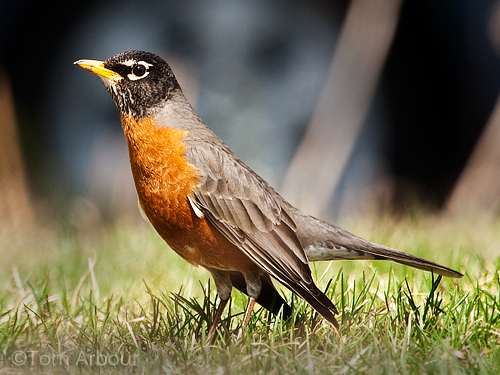 I've always wondered how the American Robin was given such a lowly sounding scientific name. The migratorius part isn't hard to figure out, but where exactly Turdus comes from remains a mystery to me. 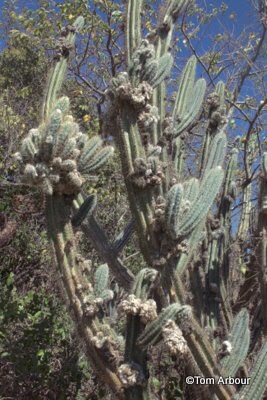 The word probably didn't have the same connotation in the 1766 when Linnaeus named this species. For some reason, I don't see many photographs of Robins on nature blogs, and I'm not sure why. They're easy to photograph and they're quite common, but they're not attracted to typical bird seed stations. Do people not want lay out on their front lawns making their neighbors wonder what the heck they're doing? Apparently I don't have that issue, although I was actually sprawled out on our asphalt driveway, pointing the camera at this robin and picking up the wheel of my neighbor's Toyata Prius in the background. Is anyone familiar with the plant Dalibarda repens? 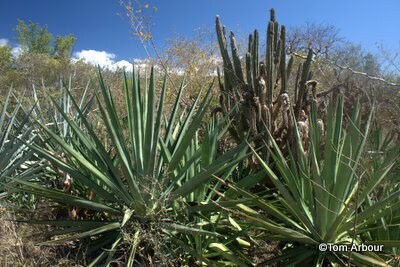 Now that is an "inside" botanical/car joke for you. Have a great day. Apparently Turdus means "thrush" in Latin. Robins are thrushes after all, so I can't complain with that scientific name, even if it isn't one that I would choose for myself. Just seconds after finding the Puerto Rican Tody, Megan and I spotted our second endemic bird, this true vireo that only lives in Puerto Rico. An inquisitive individual wanted to see what exactly we were doing with our cameras. This bird isn't quite as colorful or shocking as the Tody, but it was amazing to spot another endemic bird species literally seconds after we saw our first. 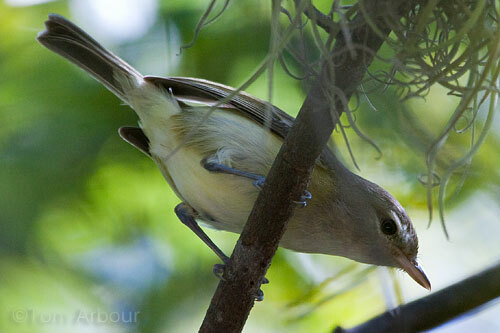 And yet mere seconds later, we saw our third endemic species, Adelaide's warbler, which I'll show tomorrow. Birds of Guanica State Forest, I hear you calling us, hopefully we'll be back next year too. Before my memory of the tropical island of Puerto Rico fades, I just need to start showing some of my images from the trip. Before we left, Megan got me a fantastic book by Mark Oberle entitled "Puerto Rico's Birds in Photographs". What a fantastic book. With over 15 species of endemic birds on the island, I was very excited to see birds that I could see nowhere else. Although I had my brain in full-on naturalizing mode, I was paying very close attention to the birds, and keeping track of all the species that we encountered. 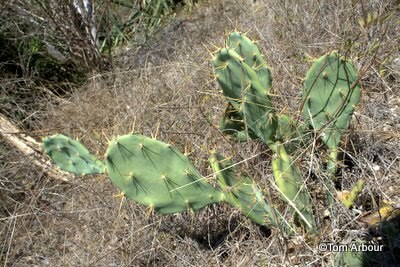 Over the next few weeks, I'll be intermixing my posts of Ohio's natural history with a few images from Puerto Rico. I hope you enjoy these amazing birds. And although Puerto Rico sounds like an exotic destination, it's only a 4 hour flight on US Airways from Charlotte- it is close. 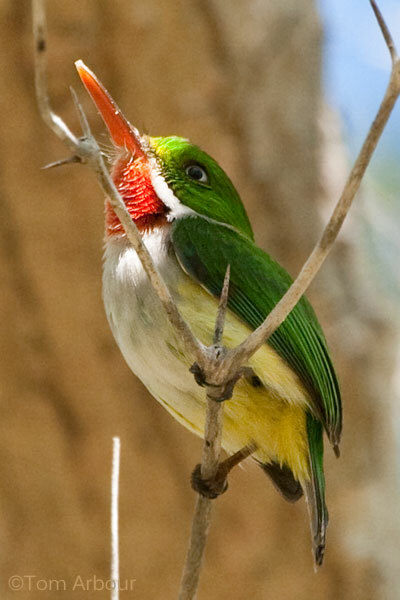 Here is the Puerto Rican Tody, the first endemic bird species we ecnountered on the island. This bird was in a dry forest in Guanica State Forest on the southwest shore of the island. Megan saw this one first and said "tommy, there's a ruby-throated humming bird, right there!" Well, it's not a hummingbird, but it surely does have a ruby throat! This past Thursday I spoke to a small but dedicated group of nature photographers at the downtown Grange Insurance Audubon Center. Although most nature centers are constructed, well, in natural areas, the Grange Insurance center is quite an undertaking of ecological restoration. The site was formerly a complex of warehouses and parking lots, but now has been transformed into a large field with native plantings and a newly constructed wetland. I wasn't expecting to see much nature at the center, but I did go down a little bit early with my telephoto lens just in case. Since I had last been to the center, a boardwalk traversing the new wetland had been constructed. 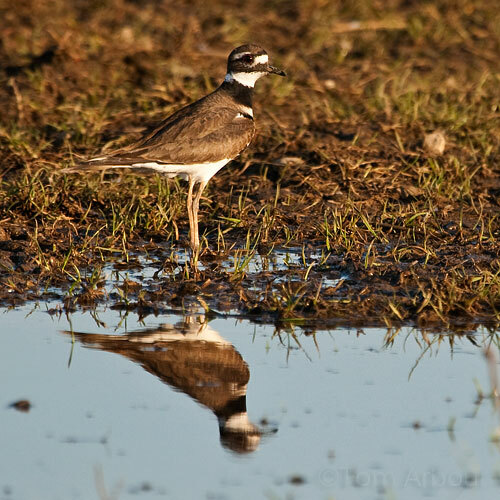 As I approached the water, a flushed three killdeer, but I hope that they would return. After getting a few shots of the dozen or so Canada geese, this killdeer did fly back to the water's edge, and I managed to get a few shots. So often I associate killdeers with weedy parking lots and junky habitats, it was to to photograph this bird along a shore. 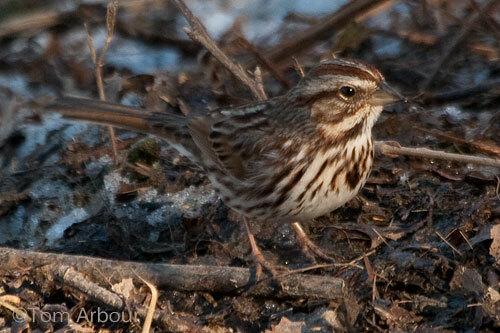 I'm not exactly what type of creature this song sparrow was after (maybe a water strider or a spider? ), and I'm not exactly sure what the outcome of this encounter was, but I must that that I was surprised to see that I had captured this action. The sparrow is chasing some type of creature. Just follow its beak and you'll see it. After a long absence, I'm participating in Misty Dawn's Camera Critters Meme. Go here to see what other animal bloggers are photographing. This is the creature of my childhood. 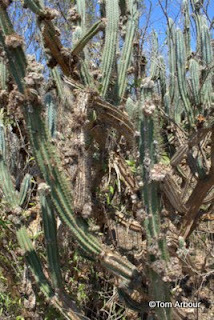 It is perhaps the species that sparked my obsession with nature and natural history. 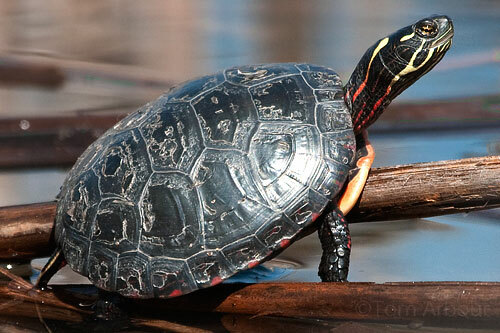 I have my grandfather to thank for this affliction- he took me to the Seiberling Naturerealm, a Summit County Metropark in northeast Ohio, when I was pretty young, and I just didn't want to stop watching the painted turtles swim around the small pond. Ever since, I have been absolutely fascinated by turtles. At my office complex, we are fortunate to have a small wetland education area. This wetland area is brimming with painted turtles, and today, I counted no less than eleven creatures sunning themselves on the dead cattail stems. 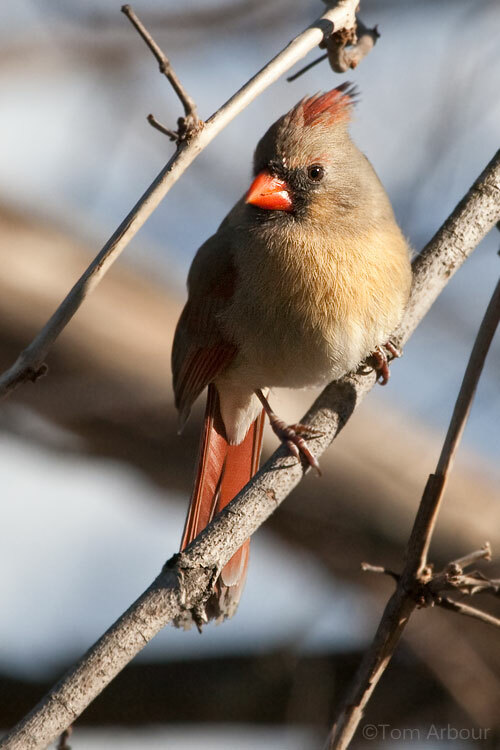 This female cardinal was attracted to the feeder at Blendon Woods Metropark a few weekends ago. When I evaluate my bird photography, I'm looking for two things. The first is whether the bird is looking straight at the camera. 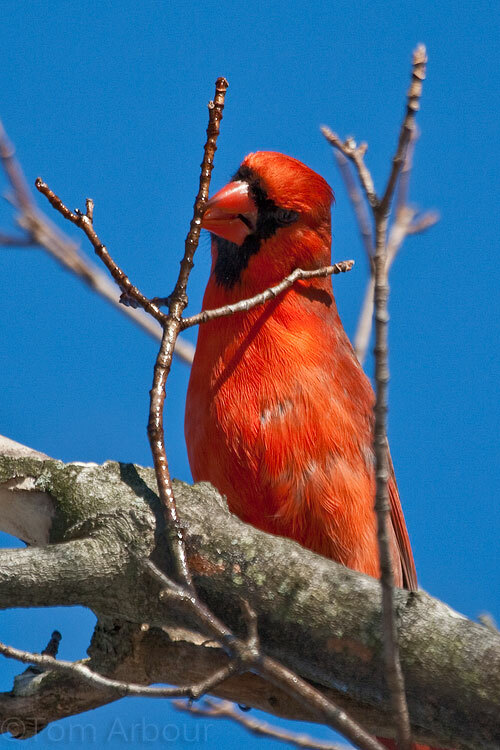 In this case, you'll notice that the female cardinal is looking slightly to my left and a bit downwards. If she was looking right at me, this would be a shot I would be really happy with. The second thing I look for is to make sure the bird's eye has that little sparkle in it, called a catchlight. 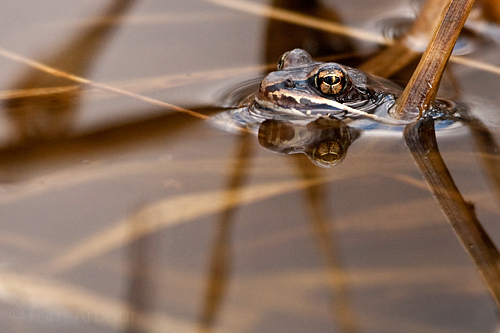 Anytime you photograph anything living, having this catch-light is critical for making the creature look alive. If the catchlight isn't there, you'll have a dull and boring photograph. The easiest way to get a catch-light is to shoot with the sun behind you. Some photographers use flash to add catchlights, and others add them later on in post processing. Take a look at your bird photographs, look at the ones you like the most, and I'll bet the bird is looking right at you and has a nice catchlight in its eye. 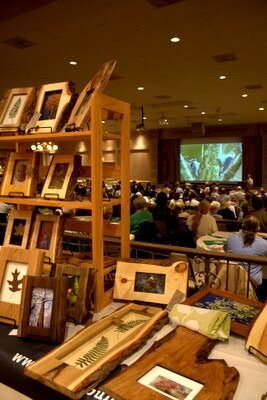 Also- I'll be speaking and showing some of my photography to the relatively new Scioto Audubon Photo Club tomorrow night at 7:00 (thursday night), just south of downtown in the brand spanking new Grange Insurance Audubon Center. Everyone is welcome! There's nothing that brings the people out like a bald eagle, and these two birds are doing just that at Highbanks Metropark. 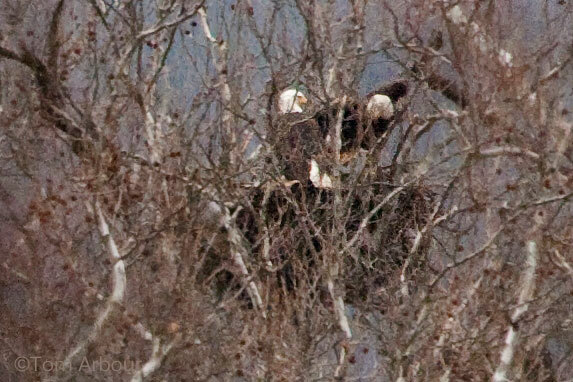 We here in landlocked central Ohio have been gaining more eagles and nests over the years, but they are still quite a rare sight. And now, there is a nest about two miles north of our home, high above the Olentangy River in a sycamore tree. I might also add that this nest is over a section of the river that is an officially dedicated State Scenic River, and a part of the Ed Hutchins State Nature Preserve. It is protection efforts like these that allow eagles to find a home at highbanks away from the hustle and bustle of a rapidly developing southern Delaware county. If you go to see the eagles nest, bring your binoculars. The birds are about 350 yards from the overlook deck. If you're there on the weekend, most likely a metroparks volunteer will have a spotting scope aimed right at the nest. Be prepared to walk about a mile and a quarter back to the overlook deck, which is located at the extreme southern end of the park. 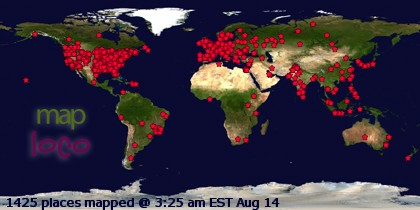 Here's a great map- you just have to get yourself to the overlook deck. Friends, keep your fingers crossed, and hope for a successful hatch. In their May electronic newsletter, Metroparks is reporting that two eaglets were confirmed at the Highbanks Nest. Yes! A successful hatch! Since the leaves are out now, the nest is NO LONGER VIEWABLE from the platform- the overlook deck that I mentioned above. Volunteers have stopped staffing this area. This doesn't mean, however, that the adult eagles can't be observed flying high above the park. In great other news, metroparks has also confirmed the presence of one eaglet in a nest at Three Creeks Metropark. This nest is not viewable from a public area. From Blendon Woods- This image wraps up my Blendon Woods series. If the weather holds, Megan, Weston and I are going to go to Highbanks Metropark to see if we can spot the brand new bald eagle nest, and hopefully bring back a few photos. And if you haven't been there already, check out my Tom Arbour Photography blog. This is where I post my best images at large sizes. I hope your enjoying the series of images that I have been posting from my trip last Saturday afternoon to Blendon Woods. Each one of these bird images was captured within a circle of approximately 100 yards- Blendon is just a great place to photograph birds. 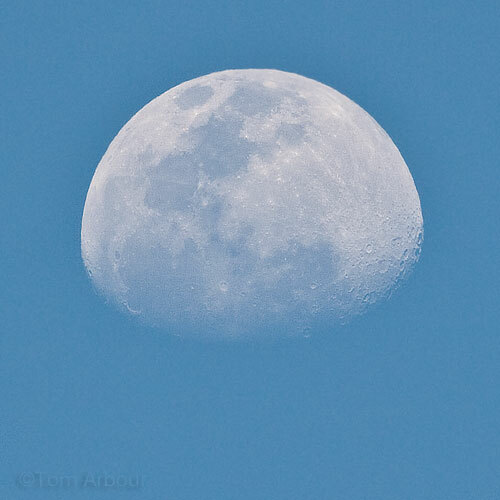 And photographing them with my recently purchased Canon 100-400 lens has been AMAZING. Here we have three sparrows. 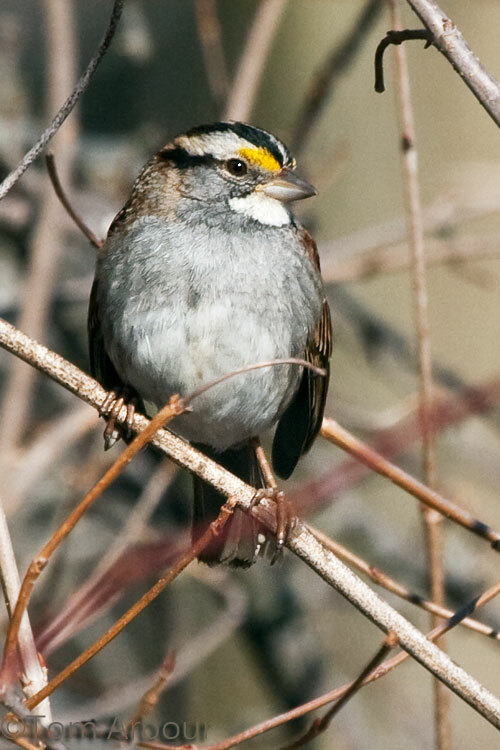 I know that when I first started really looking at birds about eight years ago when I was a graduate student at Miami University, I pretty much thought all sparrows looked the same. I have since come to different conclusions. 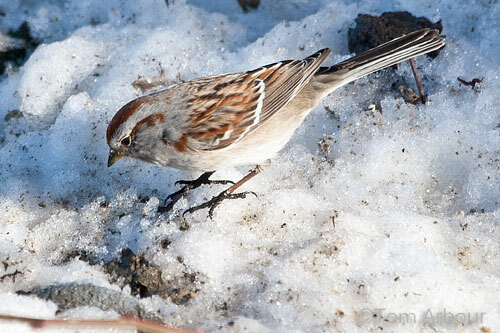 Here are three very common sparrows attracted to feeders that can easily be seen in central Ohio during the winter. 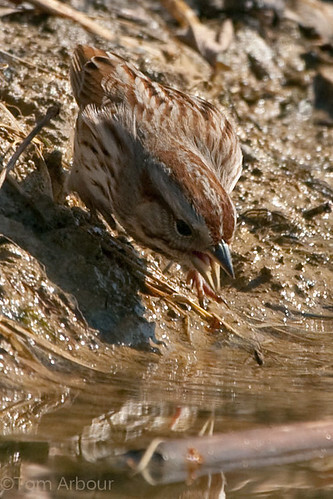 The song sparrow can also be seen year round, while the American Tree Sparrow and the White-throated sparrow will soon leave for more northern latitudes. 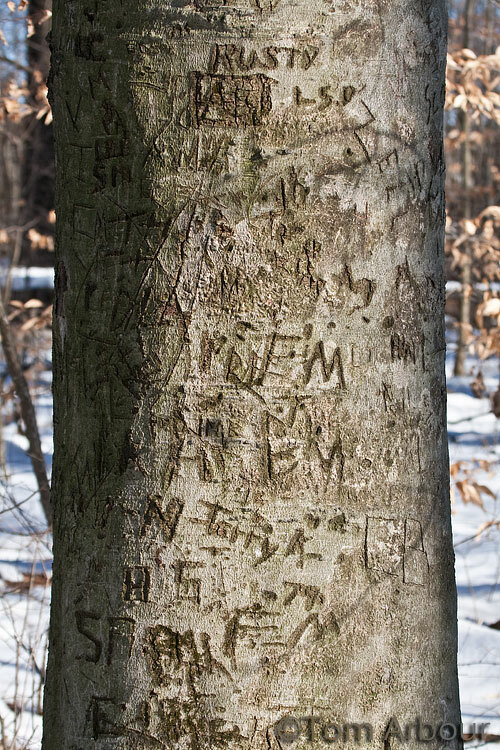 Why do we deface our mature American Beech Trees? And why do we think that we have to leave our names everywhere? (I'm apparently guilty as my name is on the tree too, via my watermark!) Almost eleven years ago to the day, I was sitting on a portable stool with my fellow Hiram College students in Carnarvon Gorge National Park in Australia. A ranger who was introducing us to the ecology and geology of hte park gave us a strong, almost accusatory warning that we Americans can't write on trees and cliff faces in Australia like we do in the USA. I've thought about this ever since, and I just don't get it. What compels us to do this? It's obviously ingrained into our culture, I'm not exactly sure how it started, and I don't see any sign of it stopping. 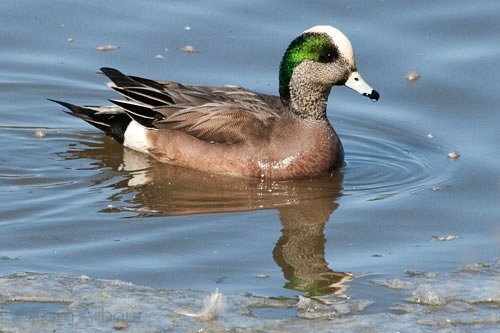 I have had several excellent opportunities to photograph American Wigeons this winter, and to be honest, I just love this duck now. That green and white head and salt-and-pepper cheeks and neck really work. These birds beg to be photographed. And the ones at Blendon Woods frequently come close to the observation buildings, allowing great viewing opportunities. As a relative beginner when it comes to trying to identify every bird that I see, juvenile hawks can pose problems for me. I took this image at Blendon Woods from the same vantage point as many of the other images I have been showing the past few days. After examining Lilian Stokes' images here, I think this could be a juvenile red-shouldered hawk. What do you think? P.S. I photographed this bird flying above a man-made pond surrounded by both forests and fields this past Saturday, March 6, in Columbus, Ohio. 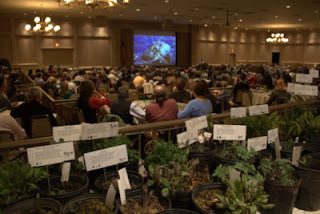 Hi blogging friends- A quick note: Tomorrow I'll be at this year's 2010 Wildlife Diversity Conference, held by the Ohio Division of Wildlife in Columbus. I'll be there attending and listening to the presentations. 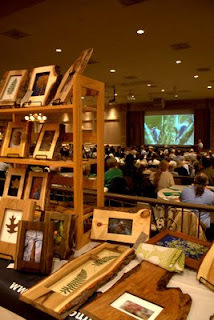 Almost 1000 people attend this conference each year- it's a great place to network with fellow nature lovers. 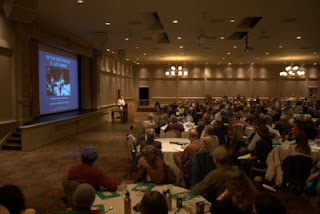 This year there will be talks that include such wide ranging topics as wild boars, kids and conservation, paddlefish caviar, and saw-whet owls! I must tell you, that before I moved to Columbus and frequented the Walden waterfowl refuge at Blendon Woods, I had never heard of a "black duck". My introduction to waterfowl was at Blendon Woods, and each year, several hundred individuals winter on the pond that is kept ice free by several aerators that constantly move the water. 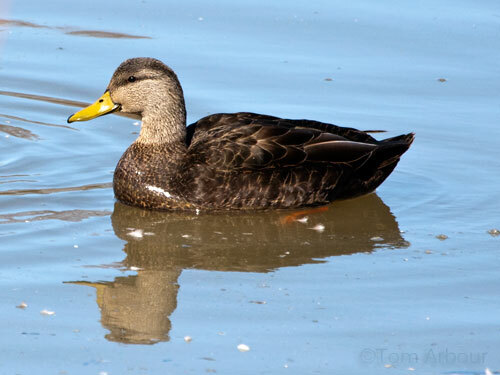 The black duck looks similar to a mallard, but the males lack the bright green head, and overall, they have a very dark appearance. The males and females are quite similar, but the best way to tell them apart is to exampine their bills. Males have yellow bills, while the female's bill is brownish. 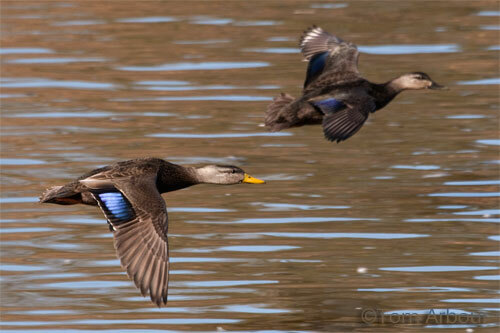 In a few weeks the black ducks at Blendon Woods will fly north to their breeding grounds. I'm hoping a few more diving ducks join them before the waterfowl migration, now in full swing, is over. After seeing the first Turkey Vulture of the season this past Thursday, I keep seeing more reports on Facebook, Twitter, and the Ohio Birds Listserv of turkey vultures. Here is one of our early arrivals gliding above the water of Thoreau Pond at Blendon Woods. 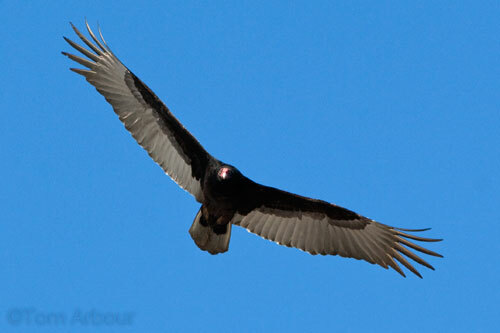 For those of you that are new to studying large gliding birds, the give-away for turkey vultures is the two-toned aspect of the undersides of their wings. 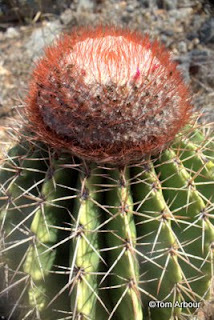 The red bald head, if you can see it, is also distinctive. Look for these things on a turkey vulture coming soon to you. I'm no Turkey expert, but after help from my twitter friend D.W. Maiden and checking out a few diagrams, this looks to be a male turkey. 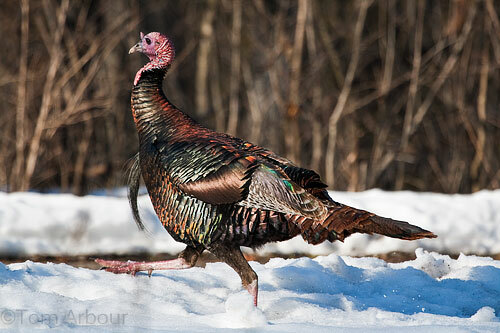 The long beard and the spurs on the lower foreleg are just two characters that set a male apart from the female. It's just too bad I didn't get a better head angle. I was in a rush to get home to Megan and Weston, and I just didn't have the time I needed to get a better images once they walked back into the scrubby woods. Blendon Woods Metropark has quite a large group of Turkeys. The last three times I have been there, I've seen at least two, but yesterday afternoon was by far the best photographic opportunity I've had. I haven't made it down to the computer where I do my photo editing, but Megan and I went to the zoo today and she took some great images. Check them out here. You'll notice that I'm wearing my recently acquired Pentax K1000 with super cool neck strap. There's nothing like shooting film with a classic camera! Then this afternoon, I spent about two hours photographing all types of birds at Blendon Woods, including Turkeys, Turkey Vultures, and black ducks. Cardinals, field sparrows were all calling, and the black ducks were pairing up. Although I'm not quite ready for the botanical season, spring couldn't come fast enough, and it's really already here. After spending a week in the sub-tropics, and now a week back in Ohio, I'm settling back into the relative boringness of late winter. I'm exaggerating a little bit here, but it just isn't the same not having endemic Puerto Rican anoles running around our backyard oak tree like we had running around the ficus trees of the Parador Villa Anontio in Rincon. I had my first personal biological sign of spring yesterday evening. As I was driving my Corolla west on Morse road., a major thoroughfare here in Columbus, I spotted a large bird in the distance. 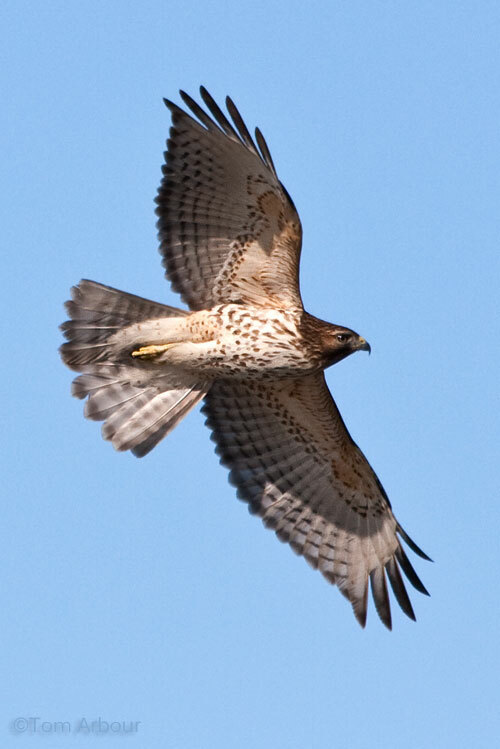 My first inclination was that it was a red-tailed hawk, but as I drove closer, I saw the black and gray undersides of the wings of a gliding turkey vulture. A small sign of spring that surely went unnoticed by most of the drivers along that stetch of road yesterday, but a great sign of spring none the less. Hurry up Turkey Vulture, only ten more days to make it to Hinckley, they're waiting for you. I'm not exactly sure how all this happened, but our little baby has become a little boy. Happy birthday son.